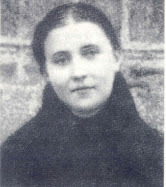 St Gemma writes: "....Then the illness becoming steadily more serious, the doctors decided to operate. The pain of the body was nothing compared with the pain of having to undergo another examination. I thought how much better it would be to die. One evening, more disturbed than usual I complained to Jesus saying that I would not pray any more if He would not cure me, and I asked Him why He made me so ill. My Angel replied to me: "If Jesus afflicts you in the body, He does it to purify your spirit. Be good." Oh how many times in my long illness He let me hear consoling words in my heart! But I never took account of them. What afflicted me most, in staying in bed, was that I wished to go to Confession and to Mass. One morning when the priest brought Holy Communion to me, Jesus made Himself felt quite strongly, and reproved me severely, saying that I was a weak soul. "It is your self love which makes you resent not being able to do what others can do or having so much dismay on finding that you have need of the help of others; if you were dead to self, you would not be so unhappy." Those words of Jesus did me good, and for some time I was joyful in spirit. At this time the family made novenas and triduums for my cure; but they obtained nothing. I myself was indifferent as to the outcome for the words of Jesus had strengthened me. I was not changed nevertheless, spiritually; for in­stance, one day a lady, who used to come to visit me brought a book to read, "The Life of the Venerable Gabriel of the Sorrowful Mother.” Almost with con­tempt I took it and put it under my pillow; I begged the lady to commend me to him, but I gave him no more thought. The family, however, began to say three Paters, Aves, and Glorias to him. 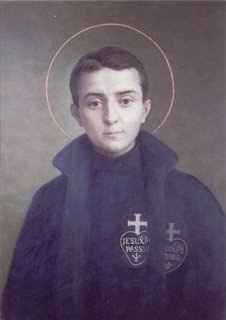 (Note- St. Gabriel Possenti also known as St Gabriel of the Sorrowful Mother died at Isola in 1862. He was canonized a Saint in 1920). One afternoon a terrible temptation came to me. I said to myself that I was weary and that lying in bed had become intolerable. The devil availed himself of my im­patience and began to tempt me and said that if I had given him the chance he would have cured me, and he would have done all that I wished. Father, I was almost on the point of yielding; I was terrified; I gave myself up for lost. All at once a thought came to me. I ran in spirit to the Venerable Gabriel and said to him, vehemently, "Save my soul first and then my body." Nevertheless the demon continued with more violent assaults. A thousand evil thoughts flashed through my mind. Again I had recourse to the Venerable Gabriel; and this time I conquered. I regained control of myself; I made the sign of the cross and in a quarter of an hour, I began to unite myself to my God whom I had treated so disrespectfully. I remember now that very evening I began to read the "Life" of Brother Gabriel which the lady had left me. I read it many times. I could not read it often enough. I admired greatly his virtues and deter­mined to follow his example. From the day that my new protector, Venerable Gabriel, had saved my soul, I began to have a particular devotion to him. In the night I could not sleep if I did not have his picture under my pillow, and I began at last to see him near me, that is, Father, I seemed to feel his presence. In every bad deed I was about to do I turned to Brother Gabriel in spirit and he restrained me. 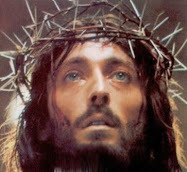 I did not fail to pray to him every day with these words: "Save my soul, then my body." Then came the day when the woman took back the Life of Venerable Gabriel. In taking it from under my pillow and giving it to the lady, I could not refrain from crying. She, seeing how much it grieved me to give it up, promised to return it after she had obtained per­mission of the one from whom she had borrowed it. She returned after a few days but she did not bring the book. This made me very unhappy. But that Saint of God wanted at once to recompense me for my disappointment and at night in a dream he appeared to me clothed in the garb of the Passionists. I was slow then in recognizing who he was. I remained in silence before him. 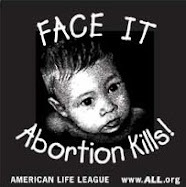 He asked me why I had wept on being deprived of his Life? I did not know what to answer but he said to me, "You see how much I am pleased with your disappointment, so much pleased that I have come myself to see you. Are you glad to see me?" I did not reply. He then caressed me many times and repeated, "Be good, because I will come back to see you." He permitted me to kiss his habit and his rosary and then he went away. I found myself that evening perfectly calm. When night came I slept. All at once I saw again at the foot of my bed my Protector. He said to me, "Gemma, make willingly the vow to become a religious." "Why?" I asked. And he replied, giving me a kiss upon my fore­head. "My sister," he said, looking at me and smiling. I understood nothing of all this. To thank him, I kissed his habit. He took the woolen heart badge that every Passionist wears on his breast and let me kiss it. Then he placed it on the sheet above my breast, and repeated "My sister!" and vanished. Upon the sheet in the morning, however, I found nothing. I received Holy Communion, and I made the promise that he asked. Meanwhile the months passed, and I was not at all better. On the fourth of January the doctors cauterized twelve times. After this I became even worse. In addi­tion to this illness of the spine, on the 28th of January, I began to suffer an insupportable pain in the head. The doctor diagnosed the trouble as a tumor of the brain. Because I was extremely weak there could not be an operation and I became worse every day. On the second of February I confessed and I received Viaticum and awaited the moment for going to Jesus. The doctors, whispering thinking I could not hear, said among themselves that I would not live until midnight. Viva Gesu! On Sunday, the 19th of February, Monsignor Volpi, the Archbishop, told me to make a Novena to the Blessed Margaret, (Now Saint Margaret Mary Alacoque -editor) telling me absolutely that when it was scarcely over I should be cured. I began it as a matter of fact the same day, and I made it Sunday and Monday; Tuesday I forgot it, and in the night (I was awakened and it was not yet past midnight) I felt a hand touch me and heard these words in my ear: "Make at once the Novena to Blessed Margaret which today you forgot." These words were said very softly. However, I saw noth­ing. I felt only the touch of the hand and heard the voice. I made the Novena at once, but I do not remember whether I finished it. On Wednesday I forgot to say it again. It was not yet past midnight when I saw all at once that the room became dark (I do not know whether to say that my sight was obscured or whether the little light that was left burning went out). Then I heard in my left ear these words: "Gemma, what are you doing? You have begun the Novena to the Blessed Margaret to obtain the favor and you have forgotten it again; does it seem to you that this is the way to ask for favors?" I was seized with a great fear; I had a crucifix at my neck; I took it at once in my right hand and was about to call my aunt to ask her to light the lamp, when I felt a hand placed upon my forehead and the same voice said: "What is the matter?" "I am afraid," I replied, and spoke the name of Aunt Eliza, but I do not know whether I was heard. "Quiet, quiet," said the voice, "be good. Of what are you afraid?" While the voice was speaking these words, the hand which had been placed on my forehead moved to the left side, and with the other hand I felt the visitor move the badge and take my left hand but without making me move. Both hands seemed to me very warm; that which I felt upon my forehead seemed to me warmer than the other. I felt no more fear, but I could not move any more; however I felt well; I did not feel any more pain. When I was calm (I speak thus because I had a little fear) the voice continued: "Oh Gemma, the Blessed Mar­garet is so afflicted because of you (at this point it seemed to me that I heard a sigh); she loves you, she would like to obtain for you so many favors, she would like to cure you, to make you all hers, but she cannot: the heart of Jesus restrains her because you pray so little, and with no devotion." Here the voice ceased. I felt happy, be­cause I thought suddenly that Jesus is merciful, that He would have pardoned me; I wanted to say: "And if I pray with devotion from now on and if I begin the Novena again, if I become good, will Jesus cure me?" But I could not speak the words. After I had made these reflections, about two minutes passed; the voice resumed: "You know what we ought to do? We ought to begin at once a Novena to the Most Sacred Heart of Jesus, and we ought to say nine Paters, Aves, and Glories, and so that you will not forget it, we will do it together for nine evenings at this same hour. 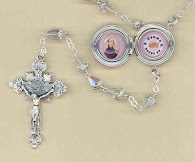 Having finished that to the Sacred Heart of Jesus, you will make one to the Blessed Margaret, and recite nine Glorias. Shall we do this at once?" (I remained perfectly quiet.) As he was saying the last words, I felt him lift his hand from my forehead, the other hand remained always firm; I heard the words that one says in making the Sign of the Cross, and he replaced his hand on the left side of my forehead, just as before; after that the same voice said: "Gemma, pray with devotion," and the voice began to re­cite the Pater, then the Ave, then the Gloria; I replied to them (the prayers), and when they were finished I do not know; I did not even feel the hand because I remained as if sleeping; scarcely had I awakened when I suddenly re­membered to make the Novena to the Blessed Mar­garet. While I felt the hand upon me, I did not feel any pain; the hand being taken away, the pain returned as usual. For nine evenings consecutively my visitor came to me to make the Novena with me. How impatiently I waited for the night! And when I saw that the room became dark, I took the Crucifix in my hands. Before I felt the hand placed upon me, I heard the words of the Sign of the Cross; then I felt one hand placed at once upon the left side of my forehead and with the other the badge put in my left hand. I heard the Pater, Ave, and Gloria recited. I replied always softly, and I did not perceive when the Paters were finished because I remained always sleeping, and upon awaking, I at once made the Novena to the Blessed Margaret. I never forgot it. In the nine days of the Novena there were certain times when I felt some fear, during the day, and I did not wish to be left alone; when, however, evening came, then I did wish to be alone, and to have the door closed, but it was impos­sible, because from the 5th of January, they never left me alone at night; I never knew whether at the moment of the visitation I would be alone. The fifth night out of curiosity I wished to notice the hour; I heard quarter past eleven strike, and when I awoke, after I had already had the visitation and made the Novena to the Blessed Margaret, I heard midnight strike; the other nights, however, I did not know what time it was. On Thursday, the 23rd of February, Sister Giulia came to see me and told me that at her convent the nuns made the Holy Hour every Thursday of Lent, between 11 and 12 midnight, the hour that Jesus assigned to Blessed Margaret; to me came at once the idea of making it and of promis­ing to Jesus that if He would cure me, I would make the Holy Hour every Thursday of my life. I would have done it at once but I did not have a book; then Sister Giulia promised to bring me the book the next Thursday. She brought it to me on the last day of the Novena; so on that day I made the Holy Hour from 10 to 11. My visitor came, therefore, after the Hour. The last day of the Novena, which was the 3rd of March*, after having made it as usual, and having felt the hands and the voice as on the other nights, I did not remain asleep. My visitor said to me: "Gemma, the Novena to the Most Sacred Heart of Jesus is finished; now finish that to Blessed Margaret.' I did it at once; I do not know, however, if at the moment that I made the Novena to Blessed Margaret my visitor was there, be­cause when I heard the words, "The Novena to the Heart of Jesus is finished," the hands were removed; however I finished the Novena to Blessed Margaret, then the hand was placed again on my forehead, and the same voice said: "Oh, how happy Jesus is about the lovely promise that you have given Him of making the Holy Hour every Thursday. Never forget it. And the Blessed Margaret is also happy; she has secured from the Heart of Jesus permission to cure you, and you ought to make to her a fair promise. Do you know what she wishes of you?" With my mouth I said nothing, but with my heart I said: "I do not know," and the voice replied:"You ought to promise her to become a Visitation nun." I replied: "Yes, yes, it is what I have so much desired." And the voice continued: "Then send for Monsignor to hear your confession, go to Communion, then arise, be­cause you will be cured. Pray always with devotion, think often of the Blessed Margaret, because she loves you and will give you many graces." "Oh, why," I asked at once, "does the Blessed Margaret love me so much when I have never thought of her, when I have never prayed to her?" And the voice said, "Because you are a poor little soul whom she wishes to bring to Jesus." In saying this he lifted his hand from my forehead, kissed me and I remained sleeping, because I did not see the light come back into the room. When I awoke I looked about; the light had increased; I touched my fore­head but there was nothing there; in my hand I saw no sign. 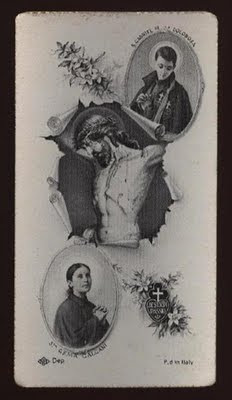 This last time, after I had finished the Novena to the Sacred Heart of Jesus, he did not touch my hand; I seemed to feel it (the Passionist badge -editor) upon my breast; in the moment when my visitor kissed me; I seemed to feel also the breath of a person on my face (I seemed to feel these things, but I do not know whether I really did). I do not know how to explain this otherwise than to say that I was very happy! I did not know how to say any other words other than "Jesus, I thank you! ... Blessed Margaret, thank you!" Often then, from the moment that I finished the Novena until the time of Communion, I have com­plained to Jesus because the days of the Novena passed too quickly. I seemed to have confidence with that visi­tor; rather the last night of the Novena, it seemed that he inspired me with confidence. "Gemma, renew to Jesus all the promises and add, that in the month consecrated to Him*, you also will conse­crate yourself wholly to Him." Then I renewed the promises to Jesus. I told Him many things from my heart, though I could not utter any word. How happy I was! Just before the cure was granted, Jesus said, embrac­ing me, "Daughter I give Myself wholly to you; will you be all Mine?" Jesus had taken from me my parents, and at times I had despaired because I believed that I was abandoned. That morning I complained to Jesus, and Jesus so good, so tender, said to me: "I, daughter, will be always with you. I am your Father; and she will be your Mother," pointing to Most Holy Mary, the Sorrow­ful Mother. "Never will one lack fatherly care who is in My hands. Never, therefore, will you lack it, even if every consolation and support upon this earth is taken from you. Come, approach, you are My daughter. Are you not happy to be the daughter of Jesus and Mary?" The great affection which Jesus had hidden in His Heart for me made me speechless. Scarcely two hours passed when I arose. Those of the household wept for joy; I, too, was happy, not because of my restored health, but because Jesus had chosen me for His daughter. And Jesus also said before leaving me that morning: "My daughter, to the grace that I have given you this morning, will be added many even greater." 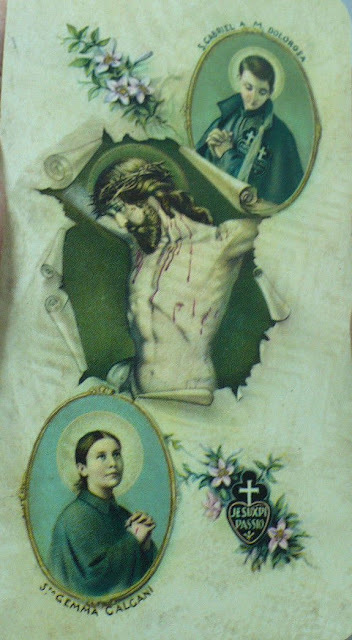 *Gemma was miraculously cured on the First Friday of the month, which is devoted to the Sacred Heart of Jesus. "When I shrink from suffering, Jesus reproves me and tells me that He did not refuse to suffer. Then I say 'Jesus, Your will and not mine'. At last I am convinced that only God can make me happy, and in Him I have placed all my hope!" Is it confirmed that the book about the life of St Gabriel Possenti that read St Gemma was the one written by Father Germanus? I ask this question because I'd love to read the same book that St Gemma enjoyed so much. Unfortunately, I wasn't able to confirm this from a trustful source. All books I read about St Gemma just say that she read "a book" about the life of St Gabriel, but they don't say _which_ book. Thusfar I have been unable to determine precisely which book it was on Gabriel Possenti that Saint Gemma read. I will post back here if I find any further info on the book. Hi Glenn! Thanks a lot for your comment. I got an Spanish translation of St Gemma's autobiography, by Pablo García Macho (passionist), and it has a footnote where he says that she read the life of St Gabriel written by Father Germanus. However, I'm not 100% sure of such affirmation, because he doesn't give any further explanation. If that was true, it would be really interesting, because that would mean she read a book by Father Germanus before he was her spiritual director! I've checked dates, and it seems possible. If I'm correct, she read that book in 1897 or 1898. I believe there're three editions of Father Germanus book on the life of St. Gabriel: One edition was when St Gabriel was venerable. Another when he was beato, and another when canonized (that edition was published after Father Germanus death, since he died before St Gabriel was canonized). Thak you for the information. It is certainly very possible that it was Father Germanus' edition. Judging by her Autobiography entries, it appears that she read it in 1898. The Passionist Priests themselves at that time were quite often in Lucca, preaching retreats etc...(For example Fathers Cajetan and Ignatius, as we read in Gemma's autobiography) and in fact the Passionists often stayed at the Giannini family home, as we read in the documents for the process of Gemma's canonisation, for example. So it is very possible that Father Germanus' book could have come into the hands of the Lady in Lucca who let Gemma borrow it. I'll let you know if I come across any furtheer info. Hello! I just wanted to say what a beautiful website you have! I have been suffering from bad back pain since August 2012 and have said so many prayers to get better. 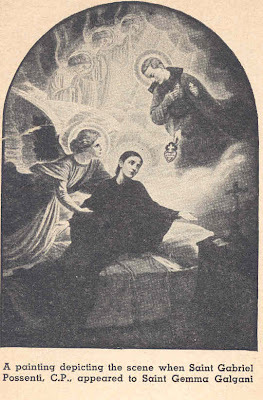 I read here about how Saint Gabriel Possenti helped Saint Gemma Galgani make a novena to the Sacred Heart of Jesus and that she was cured of her back pain, so I decided to do the same thing through St. Gabriel's intercession as well as make a separate novena (at the same time) to Saint Gemma Galgani. I just finished the novenas yesterday and my back feels GREAT! I haven't felt this good in such a long time! 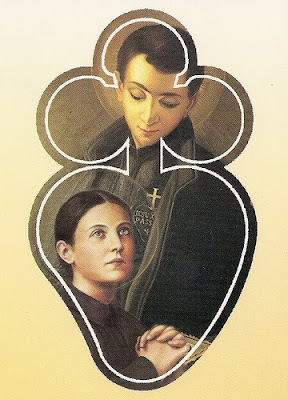 I am so happy I stumbled on this website and was reminded to pray to Saint Gemma Galgani as she is one of my favorite saints and the Patron Saint of back pain. I regret not making a novena to her sooner. Perhaps if I did I might have been cured way back in September! Thank you so much for such a fantastic website! I am learning so many interesting things about Saint Gemma!